1. Have a BYOB neighborhood block party. Invite your neighbors and friends to a ‘Bring Your Own Bike’ party. Instead of driving gas guzzling SUV’s, have everyone decorate their bikes and ride them to your party. 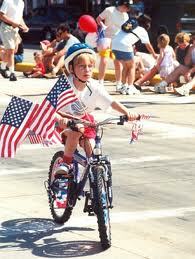 Give prizes for the ‘most eco-friendly’ decorated bike and the ‘most patriotic’ bike design. Award prizes for children and adults. Celebrate the holiday in grand style by having a neighborhood bike parade down your street. Don’t forget to bring the tots out in strollers. Invite parade spectators to waive the flag, or other eco-friendly streamers as your riders pass by. 2. Go on a ‘Fruits and Berry Happy 4th of July’ outing. Grab your gang and car pool out to a local farm to pick all kinds of seasonal patriotic berries, like strawberries, raspberries, and blueberries. Gather an assortment to be used as party decorations for your table, and to top off all of your Yankee Doodle desserts. Don’t forget the watermelon! 3. 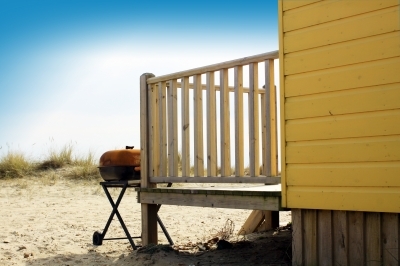 Host an eco-friendly BBQ. Cut your lawn with a push mower or an electric mower so that your friends and family can smell your fresh cut grass. Serve veggie burgers or burgers made from grass fed organic beef. Expand your menu offerings with fresh corn on the cob, tomatoes, spinach, carrots, peaches, and other local favorites from your nearby farmer’s market. If your BBQ goes toward dusk or into the evening, have on hand DEET-free bug spray or patriotic citronella lanterns, available at many natural food stores. These handy, dandy lanterns are just the thing to chase away the skeeters and the no-see-ums, who might decide to crash your red, white, and blue extravaganza. 4. Host an organic beer and fruity drink tasting event. If you want to raise a glass in honor of the 4th, consider stocking up on organic beer. Make apple or watermelon martinis and vodka watermelon for the ladies. For those patriots, who prefer non-alcoholic beverages; offer them a simple, yet tasty, 4th of July cooler which is a real thirst quencher. In a gallon pitcher combine, 2 parts purple grape juice to 1 part lemonade. This drink looks great in a punch bowl with an ice ring. 5. Have a beach blanket blowout. If it’s too far to head to the beach, save the ozone, and host a beach party. Invite your guests to bring their beach blankets to spread out on your lawn. They will agree there is nothing which says, ‘Americana,’ more than old Frankie Valley/Annette Funicello, and Elvis beach movies projected onto an outdoor screen or your outdoor flat screen. When the time arrives, switch over to the Boston Pops, or watch the night sky to catch a glimpse of local fireworks displays in your area. End the evening by gathering around your fire pit to start a ‘sing along’ of your favorite patriotic songs such as, America the Beautiful, The Battle Hymn of the Republic, God Bless America, and I’m Proud to Be an American. Our country has a proud heritage of independence, hard work, and family values. No matter how you decide to celebrate the 4th, encourage your family and friends to celebrate the earth at the same time by being eco conscious. So whatever you do, have an environmentally friendly, happy, 4th of July! Susan Singleton is a freelance writer and executive coach. She is also a staff writer for rangehoodhq.com, a site with advice and reviews on Bertazzoni Range Hoods and Thermador Range Hoods. Put all the ingredients in one (or two) bowls, add the chicken and marinate in the fridge for 15 minutes to 6 hours, depending on how much time you have. Remove from brine, blot with paper towels and get ready to grill! (NB: You can skip this step but the chicken will lack the tender, flavorful, moist-tender texture of brined chicken). One option is just using store-bought if you’re pressed for time. If not, throw butter and oil in small saucepan, add bacon, thyme and cook over medium until fat is rendered and bacon is crisp. Add onions, pepper, garlic and cook on low until translucent. You don’t want any color here. Remove pan from heat. Add the bourbon. Put back on heat and slowly bring to boil. Allow bourbon to cook down for 5 minutes. Add the other ingredients and stir, simmer and then cook on low for about 20 minutes. Taste occasionally and adjust seasoning. 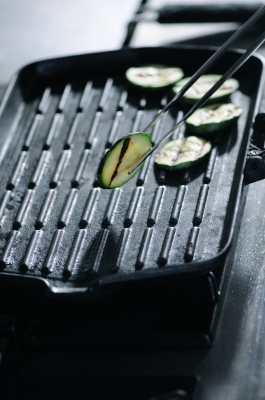 Preheat a grill pan or outdoor grill to medium heat. Lightly oil the grill with oiled paper towels (use a large wad and mind the heat). Take dried off chicken and arrange on grill. Cook for about 8 minutes on each side. For the last few minutes of cooking, feel free to baste the chicken with BBQ sauce. 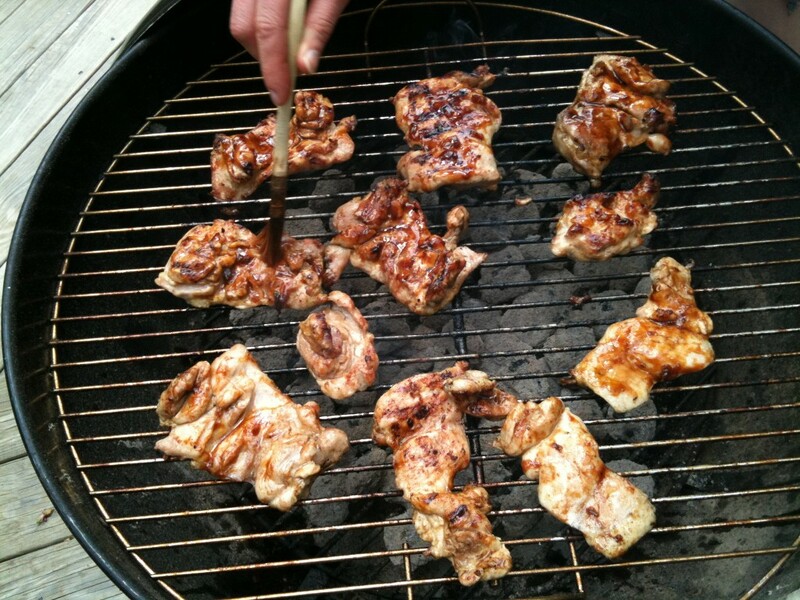 This can be messy, so skip it if you like a clean grill. Serve with plenty of BBQ sauce. Prep grill pan / outdoor grill as above and grill for 10 minutes, flipping once. Transfer to cookie sheet and cook for 15 minutes in oven. Remove and wollop with sauce. Return to finish cooking, about 20 more minutes. Serve with more sauce. With school out for summer, outdoor activities are in full swing. One fun summer time activity is outdoor grilling. Barbeques are a great way to celebrate summer holidays such as Independence Day and Labor Day, or to simply celebrate the carefree days of summer. Even if you are on a tight budget this summer, a laid-back backyard barbecue is an inexpensive way to enjoy time with friends and family. 1. The meat: One way to keep costs low is to choose only one protein to serve. If hot dogs are on sale at the grocery store, grill hot dogs and set up a hot dog bar with all the popular toppings. Also save money by being resourceful and using what you already have on hand. Grill chicken or shrimp if that is what you have. Keeping it simple with only one main protein saves time and money. 2. Side dishes: Potato salad, coleslaw, and baked beans are all popular and fairly inexpensive barbeque side dishes. However, if you are looking to keep things easy and inexpensive, stick with fresh veggies. Summertime means an overwhelming amount of fresh, seasonal vegetables which are available at low prices. Corn on the cob, zucchini and squash all grill beautifully. 3. Dessert: With fresh summer fruit available try grilling some peaches, making a cobbler or simply enjoying some fresh berries with homemade whipped cream. 4. 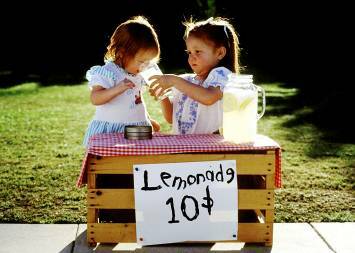 Beverages: Lemonade and iced tea are extremely inexpensive and will keep your guests cool in the heat of the summer. If you are looking for a cost effective way to serve alcoholic beverages, choose one variety of beer to serve, one specialty drink or ask guests to bring their own. 5. Serving: While paper plates and plastic cups may be convenient for gatherings, they add extra unnecessary costs. Using what you have on hand will keep your shopping list down to the essentials. Chef Heather attended and graduated from Le Cordon Bleu College of Culinary Arts, but has been developing family friendly meals since she was nine years old in her mother’s kitchen. She is an avid crockpotter and knows how to get food on the table in a pinch. She currently serves as a writer and recipe developer for meal planning site Food on the Table. Looking to add a little variety to your grilling menu this summer? 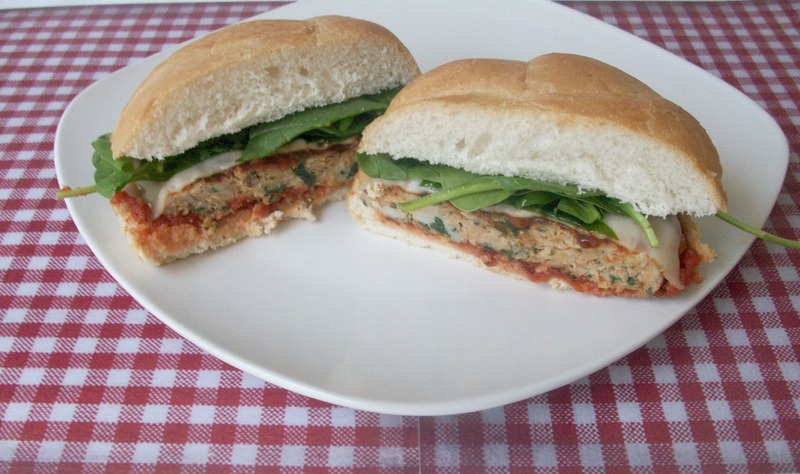 Try these flavorful Chicken Parmesan Burgers! Mix burger ingredients together and shape into 4 to 5 patties. Heat grill to medium. Lightly oil grill grate. Place patties on grill and cook 5 minutes per side or until cooked through. Spread approximately 1 tablespoon marinara sauce on each bun. Top bun with cooked chicken patty. Top patties with additional marinara sauce and mozzarella cheese. Top with spinach and serve. Chef Heather attended and graduated from Le Cordon Bleu College of Culinary Arts, but has been developing family friendly meals since she was nine years old in her mothers kitchen. She is an avid crockpotter and knows how to get food on the table in a pinch. 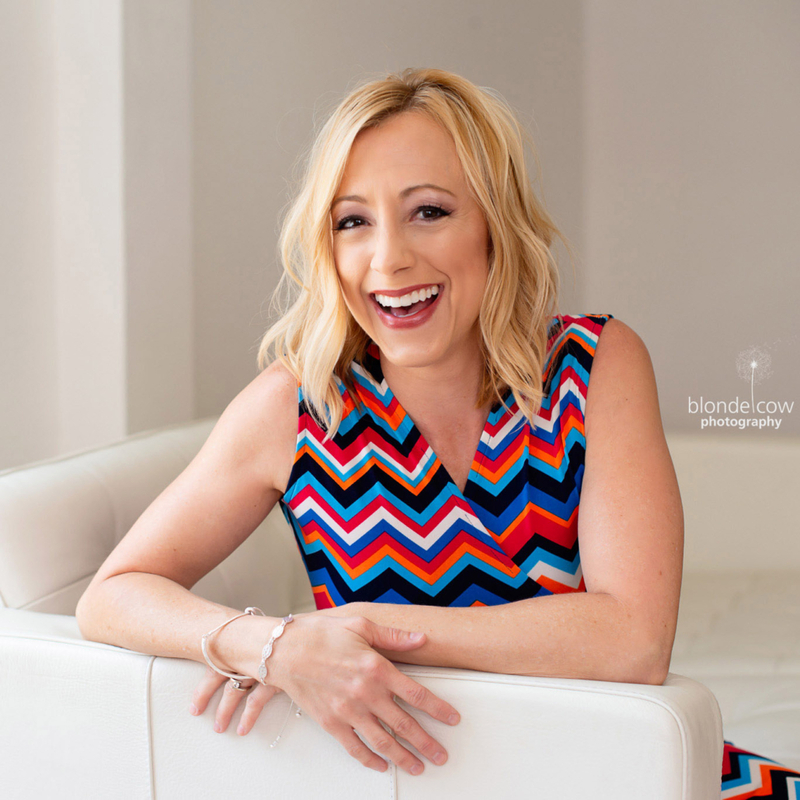 She currently serves as a writer and recipe developer for meal planning site Food on the Table. Summer is a time when you are able to linger over your food a little longer, there are usually more dinner parties and barbeques and meal times become a very social affair – unlike winter when you’re hunched over your bowl of curry under a blanket on the couch. Make the onions first by heating the olive oil in a frying pan. Cook the onions and sugar in the hot oil over a low heat for 20 – 25 minutes, or until the onions are caramelised. Stir often. Once the onions are caramelised, stir in the water, vinegar and salt and then set the onions aside, keeping them warm. Make your burgers by combining the beef mince, parsley, tomato paste, Worcestershire sauce, salt and pepper. Shape the mixture into four patties and grill them over a high heat until cooked to your liking – rare, medium or well done. Finally assemble the burgers on the toasted buns with lettuce, tomato and your perfectly caramelised onions. To make your sweet and sour sauce, combine the cornstarch, sugar, pineapple juice, vinegar, ketchup and soy sauce in a medium saucepan, and heat the mixture over a low to medium heat until it is smooth, stirring occasionally with a wire whisk. Then bring your sauce to the boil and cook for another 1 – 2 minutes, or until thick. Remove the sauce from the heat and set aside. In a large frypan or wok, stir fry the shrimp, coleslaw and water chestnuts in 1 tablespoon of oil until they are crisp and tender, and then leave them to cool slightly. Stir salt and pepper into your shrimp mixture and position an egg roll wrapper with the long edge facing you. Spoon in ¼ cup of shrimp mixture, on the bottom third of each wrapper, then fold the bottom of the wrapper over the filling, fold the sides over the filling and moisten the top edge with water to seal. In a deep saucepan heat oil to 375 F and fry the rolls in batches for 4 – 5 minutes until golden, turning them often. Drain the cooked rolls on paper towel and serve with the sweet and sour sauce. This recipe makes 12 egg rolls, and you can use leftover chicken or pork instead of shrimp. • Reduce the heat. Cooking in summer can be an expensive exercise because of how much harder your air conditioner has to work to cool down your house hot from the oven or stove. Therefore, look for ways you can avoid cooking in summer such as making sandwiches or salads. You can even cook your meals in the cooler part of the day in the morning, and eat them cold at dinner time. Or you can cook outside using the barbeque or grill, but don’t stop there because you can also take the crock pot, toaster and bread maker outside too. • Eat from the garden. Summer is such an easy time to grow your own vegetables and fruits because there is so much sunshine and everything looks green and healthy. Therefore, plant a small garden and grow your own summer meals to reduce your cooking costs and you can be enjoying fresh tomatoes, herbs, peppers or squash. • Farmer’s markets. Buying direct not only means you’ll be getting fresher produce, but you’ll also be saving money too because you’re buying in season. You won’t only find fruit and veg at a farmer’s market either, as many will sell cheese, baked goods, honey and even soaps without any bought chemicals. Alban loves cooking especially barbecue recipes. When he is not looking for new recipes, Alban offer tips and advice on how to compare home loans online. The addition of fresh mint makes this lemonade truly stand-out – perfect for a sweltering summer’s day! Press 8 large lemons in KRUPS Citruspress, then boil ½ cup of water in KRUPS Precision Kettle. Stir together sugar,mint leaves and boiling water until sugar dissolves – then stir in lemon rind,juice, and 5 cups water. Serve over ice. Heading to the beach this summer? Step out in eco-friendly style with these top picks for the planet-conscious beach gal on SheKnows.com! 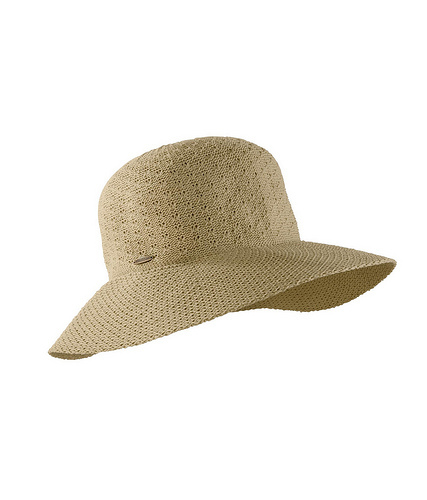 “Mom’s” article on Planet-Friendly Beach Finds was featured this week! Visit SheKnows.com. The weather is warm, the waves are high, and it’s time to show off that gorgeous golden tan that you got at the beach last weekend. You’ve already got some stylish, organic cotton threads, and your sandals are a pretty convincing faux leather, but when it comes time to accessorize with a few key pieces of jewelry, you may be at a loss as to how to go about greening up your act. Fortunately, there are all kinds of ways to get the jewelry you’ll need to spice up your summer look without doing any harm to the environment. Here are a few tips to help you along the way. For starters, you need to know what it is you’re trying to avoid. Most costume jewelry is made from plastics or low-grade metals while higher-end stuff is procured through mining. Here’s the problem with these items. The plastics, as you may know, require both pollution and waste to create, in most cases. And then there is mining. 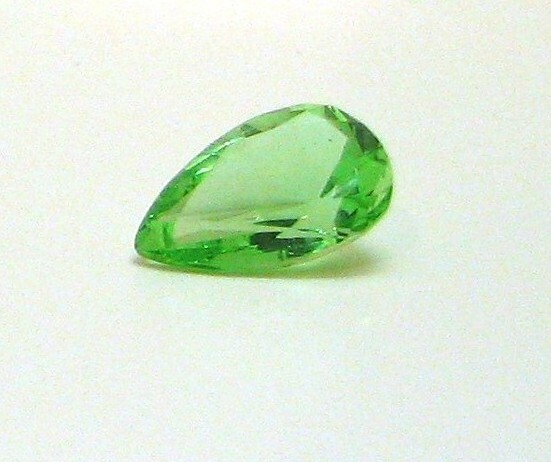 Both precious metals and gemstones must be dug from the Earth and the process is often catastrophic. Holes are blasted, ruining the landscape and displacing native plants and animal. Then there is the actual mining, which causes further devastation through the use of toxic chemicals. And finally, there is the pollution and waste that is left behind for generations to come, seeping into the ground and the water supply. So, you’ll clearly want to avoid anything made through these methods. Unfortunately, that’s a big chunk of what you’re going to find commercially. However, there are operations that are looking to change the way mining is done in order to lessen the impact to the environment. They not only use methods of mining that pollute less (or not at all); they also clean up their mess when they’re done. Further, most of these companies support fair trade (meaning their workers are paid to industry standards, rather than forced into labor or exploited with low wages). And some big names (Zales, QVC, and others) have committed to using these sources for jewelry. In addition, many companies that sell diamonds now use only stones that are certified conflict-free (no blood diamonds). But there’s more. Many jewelers now use only recycled gems and metals to create new pieces, reducing the need for further mining of our finite resources. And there are plenty of companies making costume jewelry from eco-friendly materials like recycled wood, vinyl records (you’d be surprised by some of the cool cuffs and earrings they make), aluminum from cans, old game tiles, vintage silverware (spoons, forks), glass bottles, vintage buttons, and a whole host of other items you’d never think of using to create beautiful and unique jewelry for everyday use. You can find all sorts of interesting items on sites like Etsy, Uncommon Goods, Wired Resistance, and Go Green Items (among others). Every day it’s becoming easier to find the eco-friendly jewelry that will help you to look and feel great. As more and more people continue to seek out and purchase these items, rather than those that add pollution and waste to the deal, the availability and variety of these accessories will continue to rise (while prices drop). So do your part to keep this movement alive and enjoy the many gorgeous creations that keep our Earth beautiful along the way. Sarah Danielson is a writer for Adiamor Engagement Ring where you can find a large selection of loose diamonds, wedding bands, and other fine diamond jewelry. 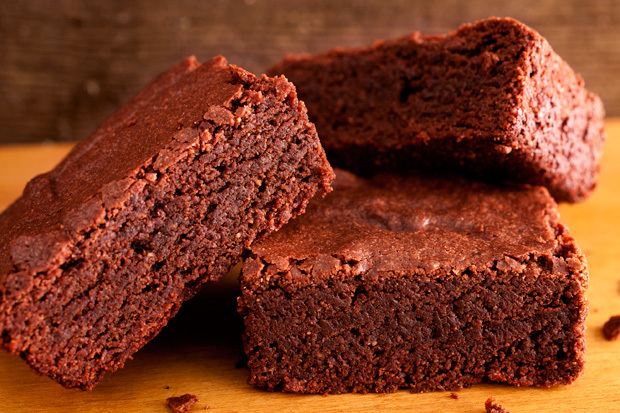 These chewy, fudgy brownies are gluten-free and oh-so-heavenly! The peanut butter at the end of the ingredient list is optional, but adds a little extra “something something” to each bite! Enjoy! Heat the oven to 350°F and arrange a rack in the middle. Coat an 8-by-8-inch square baking dish with butter; set aside. Fill a medium saucepan with 1 to 2 inches of water and bring to a simmer over high heat; once simmering, reduce the heat to low. Place the measured butter and chocolate in a large, dry, heatproof bowl. Set the bowl over (but not touching) the water and, using a rubber spatula, stir until the chocolate and butter have completely melted and the mixture is smooth. Remove the bowl from the saucepan and let the mixture cool to room temperature, about 20 minutes. Meanwhile, sift the oat flour, rice flour, xanthan gum, baking powder, and salt together into a medium bowl, discarding any coarse bits left in the sifter; set aside. When the chocolate has cooled, add the sugar and whisk to combine. Add the eggs and vanilla and whisk until smooth. Stir in the flour mixture with a rubber spatula until evenly combined. Pour the batter into the prepared baking dish and smooth out the top. If you’re using the peanut butter, drop heaping teaspoonfuls of it over the top of the batter. Drag a knife through the batter in a figure eight to create a marbled pattern. Bake until a knife inserted into the middle comes out clean, about 20 to 25 minutes. Cool completely on a wire rack before serving. Headed outdoors this summer with your children in tow calls for smart, sun-protective products! Tiny Green Mom has compiled the top five best picks for babies & kids that are planet-friendly and (dare we say it?) – sheer genius! Could this adorable swim diaper be any more convenient? 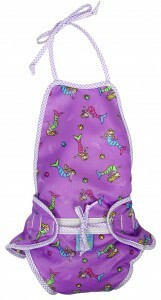 Kushies® has combined the typically awkward swim diaper and made it into a cute, reusable suit! Ingenious! Both planet-friendly and economical, the Kushies Swimsuit Diaper is must-have this summer for any family hitting the pool or beach. Available in sea-worthy designs, such as mermaids, the swimsuit diaper is easy to get on and off, and the wrap style design makes it a breeze to change your child. Plus, the adjustable waist with added ties provides a snug, secure fit as your child grows. Kushies® has done it again! 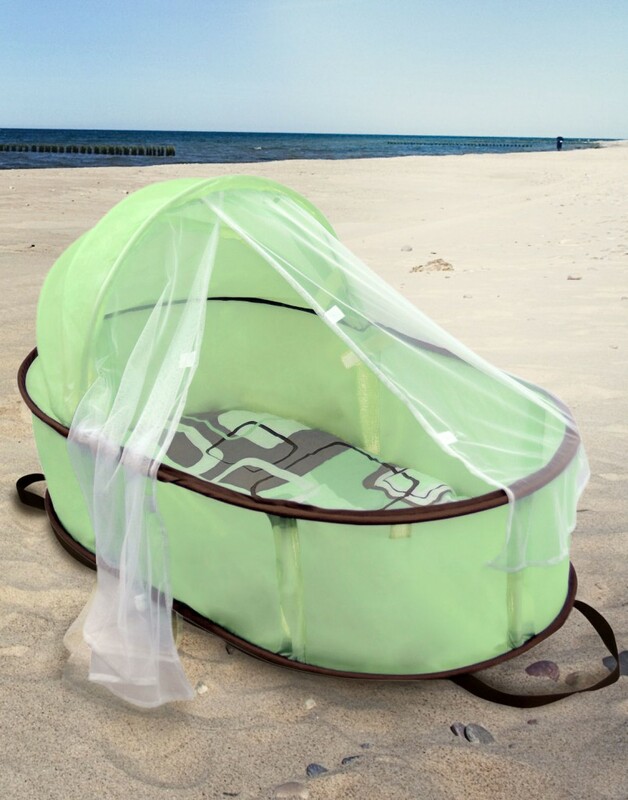 They have created a wonderful solution for families headed to the beach or to play outdoors, but don’t want to place baby on a blanket alone. Kushies’ Easy Fold Baby Bed is simply ideal for traveling, is both lightweight and portable, and it fits easily into a standard suitcase to keep baby safe and secure when away from home. 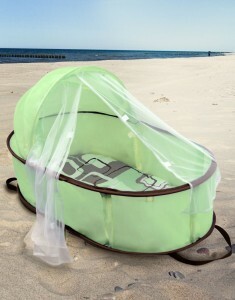 Expertly designed, this portable bed features UV protected fabric which keeps baby safe from the sun when in the sun. What’s not to love? Whether you spray it on with the convenient spray nozzle or rub it on, this SPF 30 All-Natural Kids Sunscreen from Goddess Garden offers your child full-body coverage in a sheer, non-whitening formula! Not too chalky or thick, this water-resistant sunscreen is dermatologist recommended and is made with 82% organic ingredients. “Mom” loves that not only does it glide on easily, it is free of synthetic ingredients and toxic chemicals. Plus, the sunscreen was recently top rated by the EWG in 2011 for its superior broad spectrum effectiveness and non-toxic formula. You will want to make sure it is tucked into your purse or beach bag this summer when headed outside with your little ones! 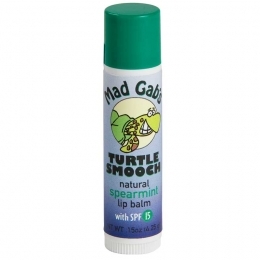 Protect your little one’s lips with Mad’s Gab’s Natural Lip Balm, which offer SPF 15 protection in a variety of flavors, such as Vanilla or spearmint. Even more kid-friendly – all of Mad Gab’s balms are named after a sea creature or animal, making it less of a struggle and a whole lot more fun to get your tots to put on their lip protection! Choose from a selection of Aquarium Smooches, such as Turtle Smooch or Zoo Smooches, such as Monkey Smooch. All Mad Gab’s lip balms are made with Organic palm oil, organic extra virgin olive oil, beeswax, flavor, organic hemp seed oil, vitamin E, and rosemary extract. Why didn’t we think of this? Every parent has covered their little one with a swaddling blanket or small quilt when in the sun to protect tender skin, but Coolibar has gone a step further by adding UPF 50+ protection! This ingenious Sun Blanket is made of Coolibar’s own ZnO Suntect fabric, in a lightweight, breathable cotton/bamboo/spandex blend. Super-soft and perfectly sized for little ones, the Coolibar Sun Blanket is available in four gorgeous summery colors: melon, white, crisp aqua, and morning sky.